The leaves on a mature tree can be very long indeed - they are probably bigger than the leaves of any other wild tree in the UK. 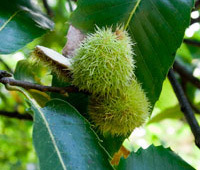 The Sweet Chestnut has been planted in large quantities in the South East for charcoal manufacture. May be coppiced and used for stakes, gateposts, post and rail fencing. Often planted alongside oak, as an understory. Simple leaves, arranged alternately along the shoot/twig. The leaves are long (up to 20cm in mature trees) with prominent veins and a pointed tip. The edge of the leaf is serrated, bit like teeth on a saw. The leaves when mature have a dark green colour. Young leaves may have hairs on the lower surface. The buds alternate on young shoots. White lenticels (breathing pores) may be seen on young twigs / shoots. Bark on young trees is a dull silvery purple, with vertical cracks. Spiral fissures may develop on old trunks; the bark is brown. Sweet Chestnut is monoecious: it has separate male and female flowers. Male catkins are long and yellow and look a bit like hairy, golden caterpillars. Trees flower relatively late - June/July. Female flowers are green rosettes. Later in the year, a prickly, leathery casing forms containing the nuts.